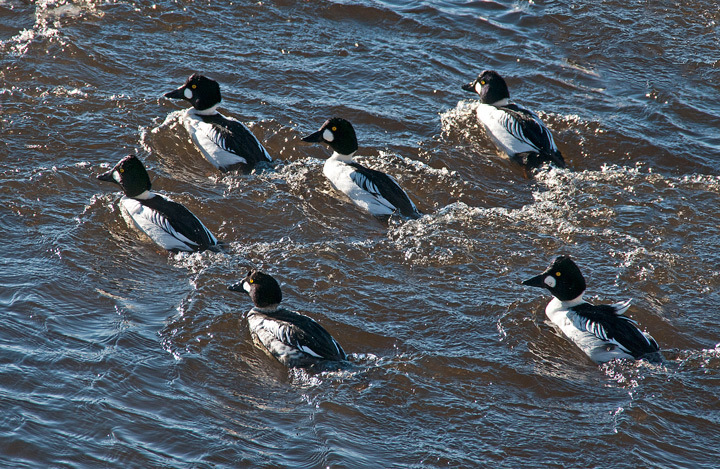 In the past I saw large numbers of Common Goldeneyes in the Duluth Ship Canal and Harbor but after the brutal winter of 2014 when everything froze up they seemed to disappear. This year they are back although in smaller numbers. 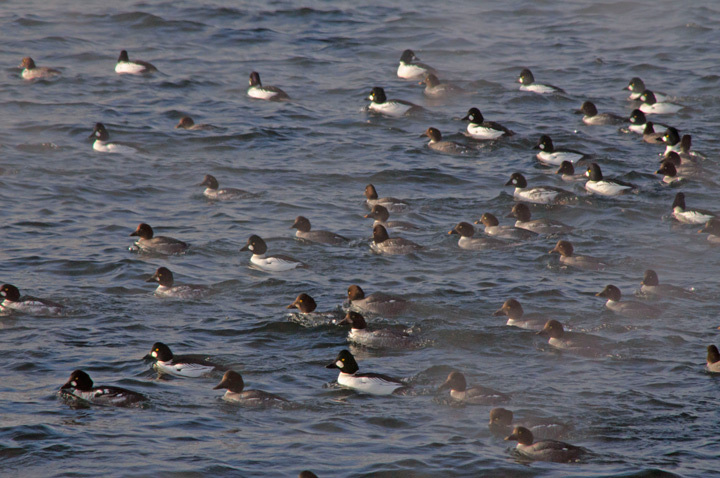 During the winter Common Goldeneyes gather in the open water of Duluth Harbor. 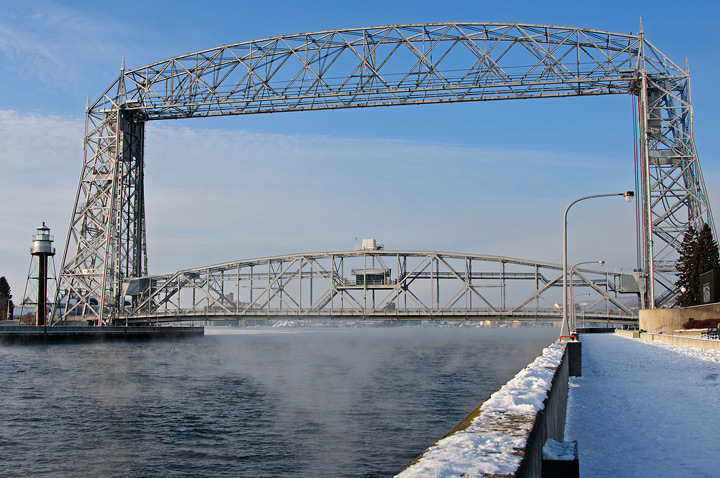 There were large numbers of them under the Duluth Aerial Lift Bridge on this cold morning. Several weeks ago I had an opportunity to walk around Canal Park just as the ice was clearing out of the harbor. 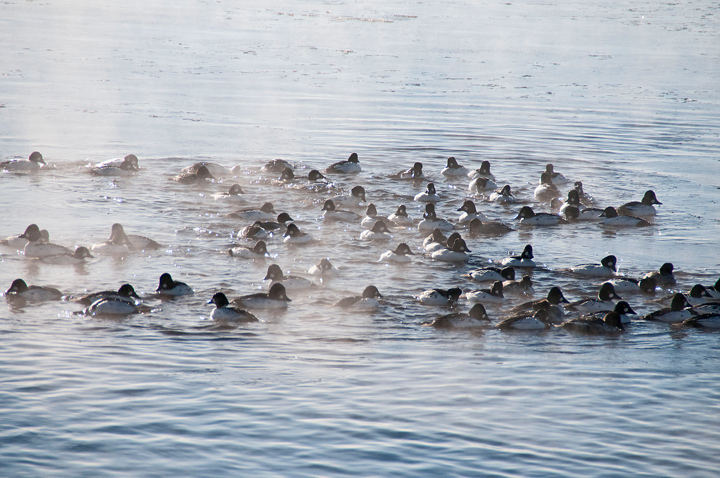 There were large numbers of Common Goldeneyes diving in the harbor. 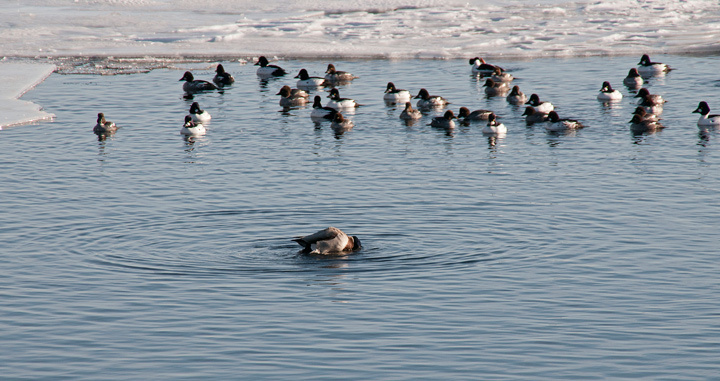 They were really fun to watch as they, all of a sudden would dive into the water and then pop to the surface. 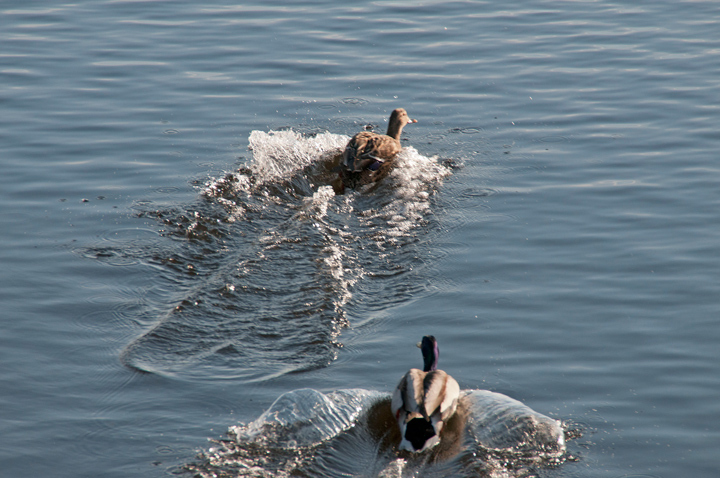 As we watched a bunch of them were under the water and all of a sudden seem to fly out of the water and into the air. As I was watching the goldeneyes I noticed a pair of Mallards acting a little strangely in the foreground of the photo I was composing. As a watched they started to mate in the water. When they were done they took off at high speed. As I usually do when I’m in Duluth I woke up before dawn to check on the potential for a great sunrise over Lake Superior. On this particular day It didn’t look like it held much promise so I slept in for a while. Later in the morning I checked again and it was a beautiful sunny day but it didn’t look like it would last long. I also noticed quite a bit of steam rising off of the lake so I grabbed the camera and headed out. 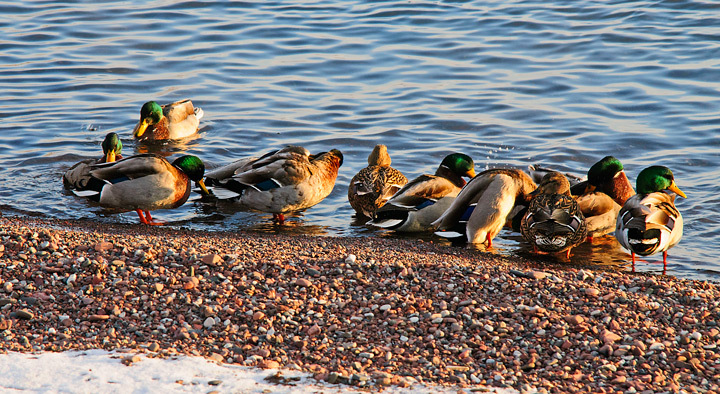 As I walked down to the wooden cribs on the beach a flock of Mallard Ducks flew from the rocks where they had spent the night. By the time I reached the beach they were in the water. As I walked along the beach they followed me in a large group. When I reached Uncle Harvey’s Mausoleum steam and the sunlight created a nice scene with the sun just peaking out over a cloud and the steam rising from the Lake. 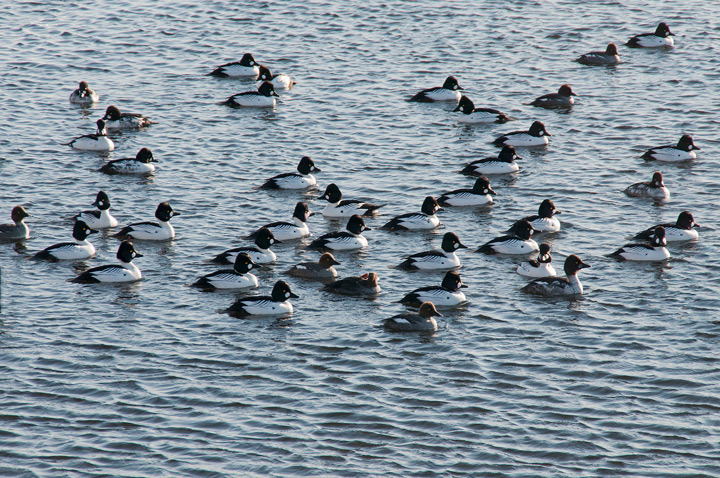 When I reached the Shipping Canal it was clear of ice and filled with Common Goldeneyes. 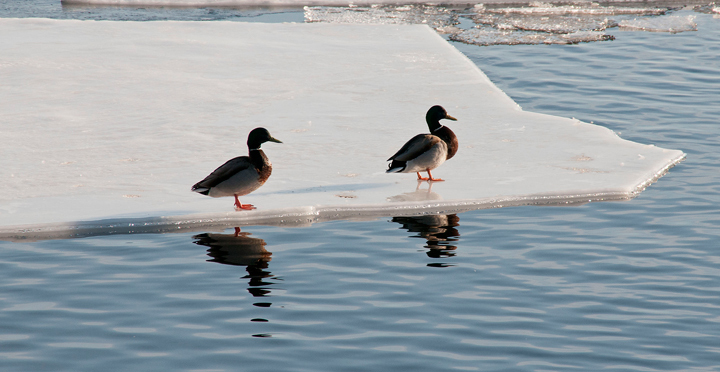 Apparently they like to hang out in the area during the early winter when the canal is free of ice. The Shipping News indicated that a ship was going to be coming out of the harbor between 8 and 10 but I didn’t see one so I went back to the condo for a morning cup of coffee. As I started drinking my coffee I checked the AIS/Marine Information Site located in Thunder Bay. It showed a ship leaving the docks and heading toward Canal Park. My wife and I decided to walk down to the park and watch it depart Duluth. 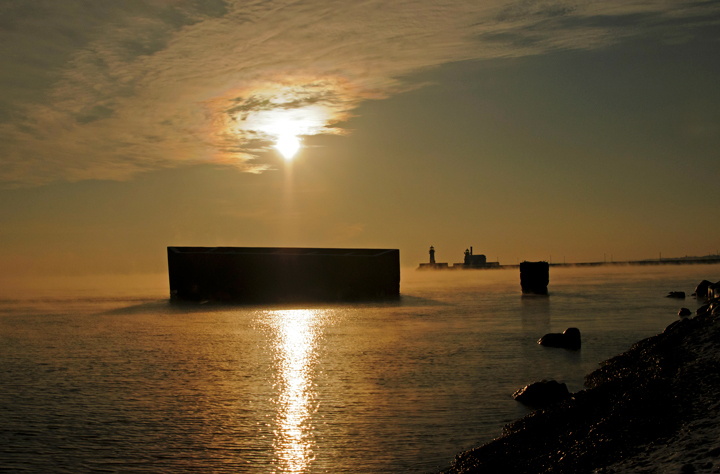 As an aside if you are in Duluth and want to know when ships are leaving the docks or are going to be arriving you should check two websites. 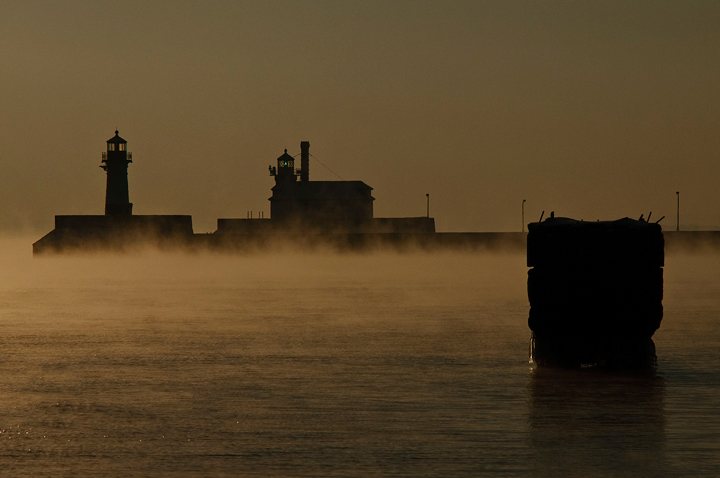 The Duluth Shipping News lets you know what traffic will be taking place during the day and gives approximate arrival and departure times. 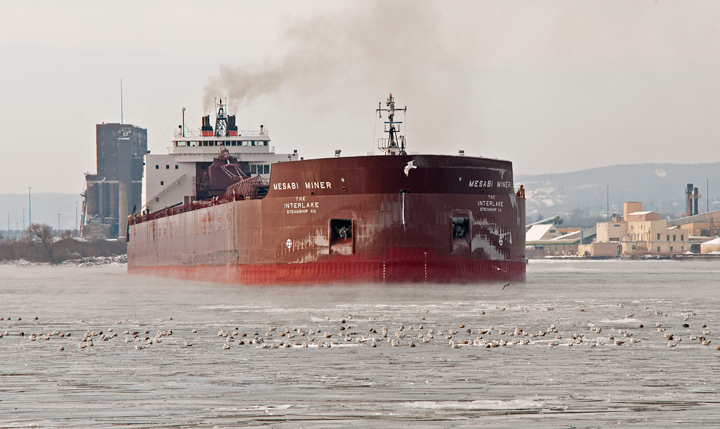 If you want to see where the ships are at any given time and watch their progress you should check the AIS/Marine Information Site located in Thunder Bay. This is the only AIS site I can find that covers the Duluth/Superior Area. It shows the location on any ship broadcasting an AIS signal. I typically use this site to plan my visits to Canal Park to watch ships arriving or departing. 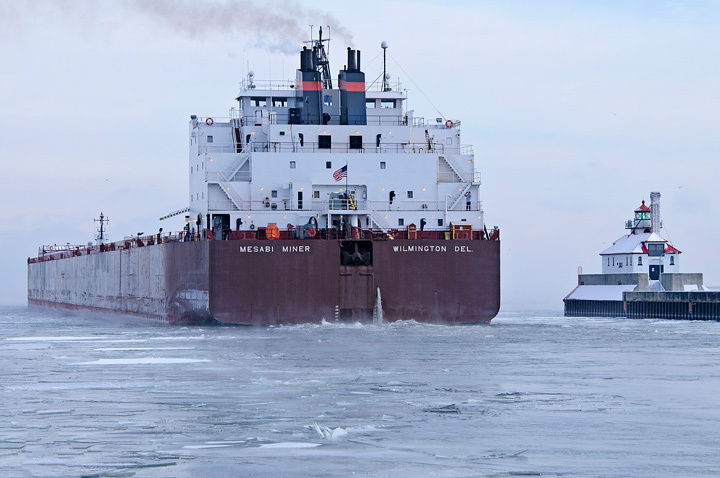 When we arrived the Mesabi Miner was just making the turn in the harbor to head out through the Shipping Canal. When I had been in the same area an hour earlier the harbor was ice free. Now there was considerable ice and a large flock of Gulls sitting on the ice in front of the oncoming ship. We watched as the ship headed out to a cold Lake Superior. More photos of Canal Park can be found on my website.